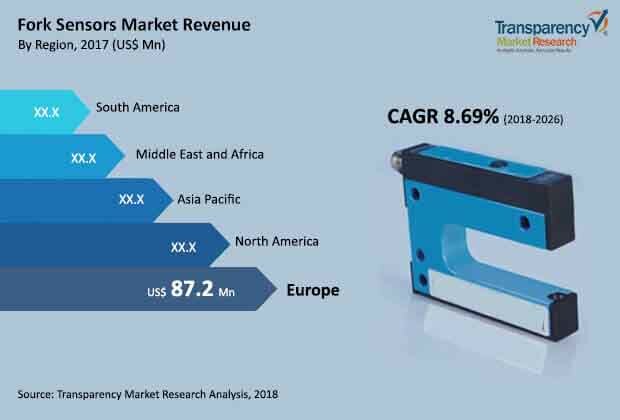 The global fork sensors market is projected to register compound annual growth rate (CAGR) of over 8.69% from 2018 to 2026, according to a new report published by Transparency Market Research (TMR) titled “Fork sensors Market – Global Industry Analysis, Size, Share, Growth, Trends, and Forecast, 2018–2026.” The fork sensors market is expected to grow significantly due to increased cost efficiency and long life duration. The report suggests that the rising integration of IoT with fork sensors technology is expected to boost the fork sensors market at the global level during the forecast period 2018-2026. In August 2017, Leuze electronic GmbH, a significant provider of fork sensors, collaborated with Microsoft Corporation to accelerate the use of Internet of Things (IoT) solutions. Additionally, fork sensors based solutions are gaining popularity in manufacturing applications, which holds a significant share in the market. Prominent fork sensors providers are focusing on R&D investments for further improvement of their current sensor based offerings. For instance, in August 2017, Banner Engineering Corp. developed a new building for research and development in Minneapolis, the U.S. This initiative by the company will boost new product development and also focus on smart sensor technology solutions. These developments are expected to have a positive impact on the global fork sensors market. Europe is expected to hold the highest share of the market during the forecast period. The factors contributing to the higher share are the prominent number of fork sensors players such as Leuze Electronic GmbH, Sick AG, and SensoPart Industriesensorik GmbH, along with the rising initiatives taken by the leading firms for further market penetration. For instance, to increase the precision for detection in smaller objects, Baumer (a significant provider of sensor technology) introduced laser fork barriers with fork width ranging from 30-120mm for simple detection of small objects upto 0.1mm with red and laser light sources. Additionally, market leaders are focusing on integration with latest technologies for further market penetration. For instance, in February 2017, Leuze electronic GmbH, a sensor technology company, with headquarters in Germany, introduced Smart Sensor Business 4.0, focused on tool manufacturing and metal working industry to boost the growth of its current sensor based offerings. Omron Corporation, Sick AG, ROHM Semiconductor, and Pepperl+Fuchs GmbH are some of the major players operating within the fork sensors market profiled in this study. Various market players are entering into partnerships to enhance their fork sensors offerings worldwide. For instance, in September 2017, Gimbal formed a partnership with Kube Systems, a significant provider of mobile device charging, to provide location based marketing solutions to the hotel industry. Additionally, in May 2017, Datalogic S.p.A, a prominent fork sensors provider, launched an enhanced partner advantage program which made business with Datalogic easier and provided enhanced rewards channel commitment and performance. The company provided a marketing incentive to its partner named Loyalty League whereby the partner company can claim prizes on the sale of a Datalogic product.